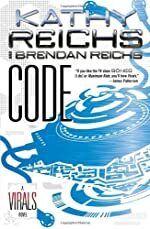 CODE by Kathy Reichs and Brandan Reichs. A Virals Novel. Review: Welcome to the adventurous, thrilling, suspenseful, and modern world of Victoria Brennan created by Kathy and Brandon Reiches! Tory is smart, quick thinking, determined, and is the man with the plan. She will take you on a giant clue hunt that will dazzle your mind. When The Game was afoot Tory was ready to take the challenge in CODE by Kathy Reichs and Brendan Reichs. The story takes place in Charleston, South Carolina during the 21st century. Tory is a 14-year girl who is the leader of a pack called the Virals. The pack consists of Ben, Shelton, and Hi (also called Hiram). They are called the Virals because a virus infected them giving them part canine DNA. This allows them to ÒflareÓ activating their canine side, which makes all their senses, and strength go beyond what is humanly possible. Tory's very special ability is to see into other people's minds. In the story they go on a clue hunt designed by the Gamemaster. You would think that there would be no harm in doing this but the Gamemaster has set a timer upon it and if they don't find each clue within the time limit a bomb goes off and people die. Also if they notify anyone of The Game a bomb goes off and their family may even die. Will they find the clues in time to stop the Gamemaster and win The Game? Find out in CODE. This book is just spectacular. I have many great things to say about this book so I'm going to start with the plot of the story. The introduction of the story snatched me by my shirt and held me captive. I think the introduction was great because it started off not too calmly but not to intensely which is good since it had a mild start to it. I also liked how the author described the setting by using short statements. For example: "Tern Point. Loggerhead Island. Ben Blue and I were perched upon a wide stone ledge twenty feet above the Atlantic Ocean." The setting created an image, which definitely engaged me. As another point the setting was integral because the story could not have happened anywhere else. Secondly the rising action and climax were very fast-paced. This was a this was at it's max when they were trying to stop the gas at the debutante ball and when they were chasing down the Gamemaster. This was especially fast paced because the story moved from one scene to another very quickly but at the same time putting in good description, which helped me keep track of what was going on in the story. Also at the end of each chapter there was a cliffhanger, which consumed my mind and made me keep reading. For example: "'Chance Claybourne.' He shook his head in disbelief. 'He's coming back to Bolton.'" The last thing that I have to praise about the plot is that the conclusion was pleasing (I'm not allowed to tell you about the end otherwise I would spoil it.). Also just by the ending I could tell that there was another book on the way. Next I would like to praise the characters. Tory is a round and static character. I also forgot to mention that the story is told from her point of view. This enhances the readers experience by making the reader feel like it is himself or herself experiencing what Tory is! Ben has the following traits: strong-willed, loves Tory, physically strong, selfish, good-looking, dishonest, and jealous. Shelton is smart, resourceful, friendly, and cautious. Hi is smart, geeky, willing to do anything no matter how embarrassing, easygoing, and immature. The readers could definitely relate to the main characters and the character where also very interesting to read about. All in all I rate this book 5 out of 5 stars! This was the best book that I have ever read! I would also say that this book would be most appropriate for children 13+ because of the scenes and language of the story. CODE is my favorite book ever and I hope you like as much as I do. This is a book that many will adore and love. Have fun reading! Review written by Ronak (6th grade student). We would like to thank Random House for providing a copy of CODE for this review. Have you read CODE? How would you rate it?